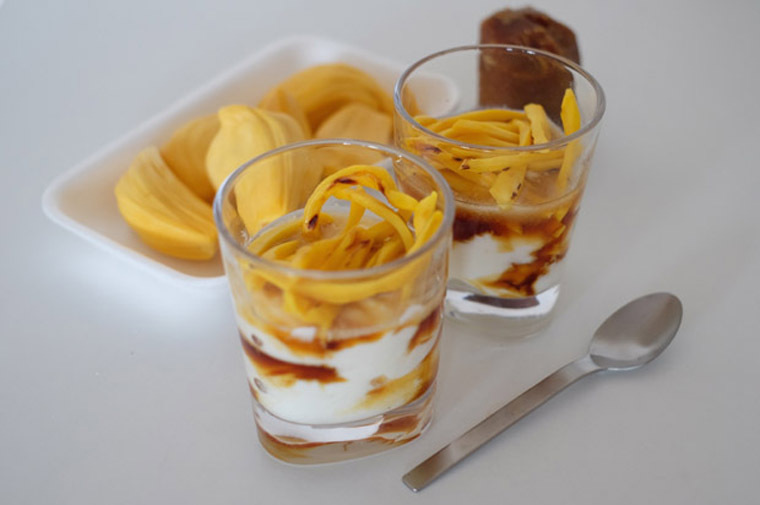 Imagine thick creamy yoghurt sweeten with fragrant gula melaka and topped with grilled sweet nangka. Oh, it’s the perfect blend of flavour and texture – sweet and sour, creamy and chewy…I’ve first tasted this dessert at a hipster cafe in Georgetown, Penang. At Mugshot Cafe, they make their own greek yoghurt, a strained yoghurt with creamier texture. They’ve got three flavours: mango and walnuts, kiwi and honey, and, my favourite, gula melaka and nangka. Step 1 Make a slit on a piece of nangka with a knife, remove shell and flatten it. Place it on a grill pan and grill until slightly charred. Then cut into thin slices. Step 2 Make gula melaka sugar syrup. 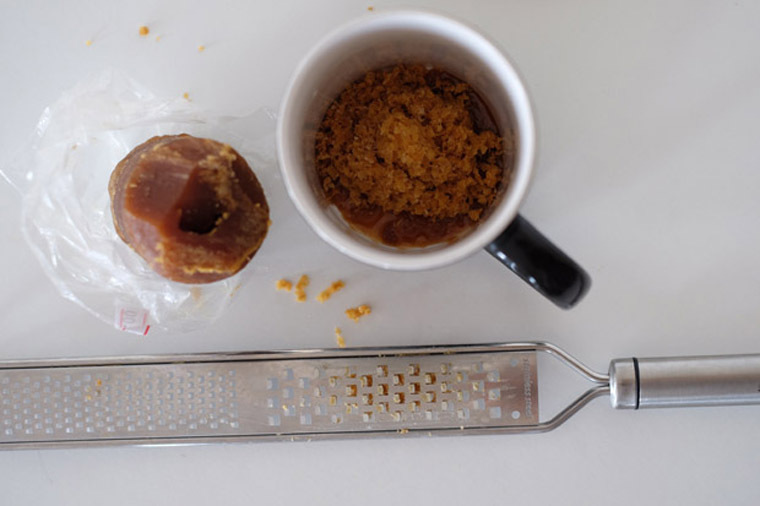 Chop or grate gula melaka and place into a mug. Add 1 tbsp of water and pop into the microwave for 30 seconds. Stir well until gula melaka is dissolved. 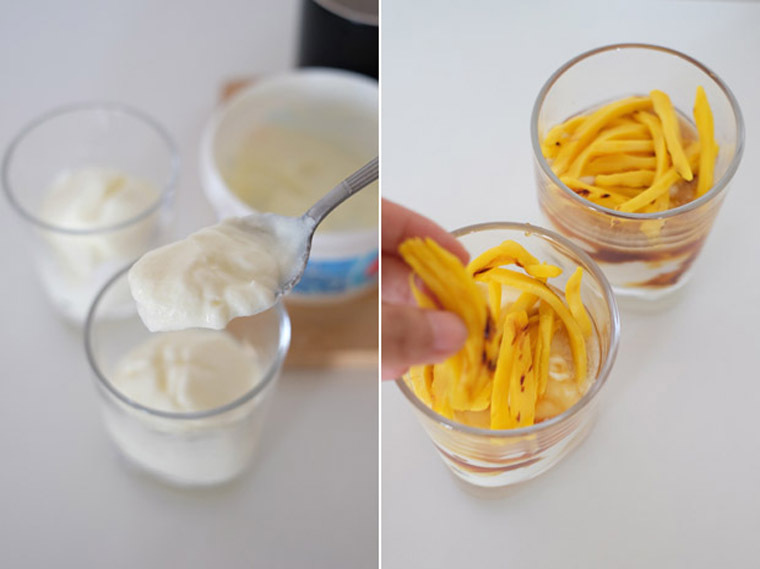 Step 3 Scoop yoghurt into a clear glass, pour some gula melaka syrup onto it and top with sliced nangka. Step 4 Pop into the fridge and eat whenever! Microwave 1 tbsp of water and 3 tbsp of grated gula melaka for 30 sec. Stir until gula melaka dissolve. Scoop 1.5 cups of yoghurt into 2 glasses. 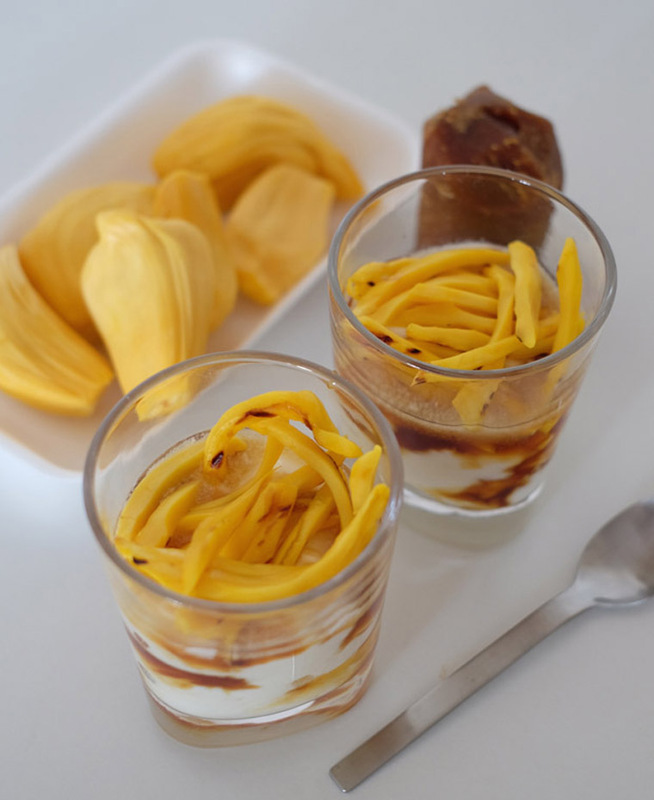 Pour in gula melaka syrup and top with sliced nangka. I use Sunglo yoghurt. It’s thick enough that you don’t really need to buy the normally more expensive greek yoghurt. 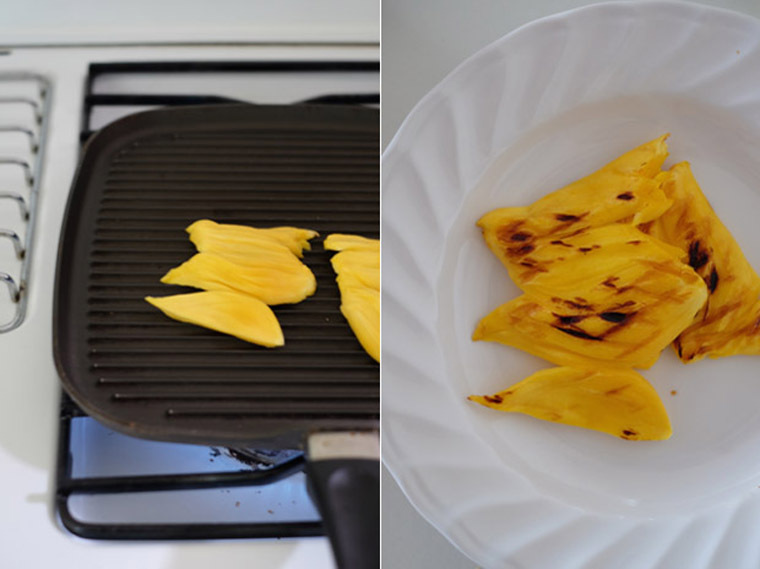 You can skip grilling the jackfruit. However, I like that the flavour intensified when the fruit receive some heat and the charred marking make the dessert looks even more inviting. I’ve recently gotten used to really good quality gula melaka (palm sugar) that the one that I have was not up to my standards. It lack the darker caramel note, and was so hard I had to grate it. A quality block of gula Melaka will easily be shaved off with a pair of knife (How to choose good quality gula melaka). Having said that, it still taste much better compared to regular sugar. Besides, as this is the normal standard when eating out, you may not enjoy the deeper flavour of authentic gula melaka. You can of course serve them in a mug. But it’s much prettier in a clear glass as you can see patterns of brown palm sugar syrup and the vibrant yellow of nangka through it. Make ahead and keep it in the fridge. It should last for a few days.